Gaysorn is a luxurious, upmarket white marble and gleaming chrome complex housing exclusively high-end luxury goods and designer labels. Its contemporary design and an innovative retail concept create a very exclusive shopping experience. Expect to find a wide range of highly desirable international brands like Louis Vuitton, Gucci, Prada and Hugo Boss, to name but a few, as well as a selection of Thailand's most innovative designers such as Fly Now, 'Senada Theory and Kloset Red Carpet. Located in the legendary Ratchaprasong shopping district, the cool and infinitely sophisticated Gaysorn is walking distance from other shopping malls like CentralWorld and Erawan, and presents a tranquil and refined retreat from the neighbourhood's hustle and bustle. Gaysorn is reinforcing its position as a premium lifestyle shopping center with the introduction of a 'Lifestyle Consultant' team, with the aim to provide a full lifestyle shopping experience that includes the highest levels of quality of service, from fashion and style, conceptual parties and gifts for all occasions. 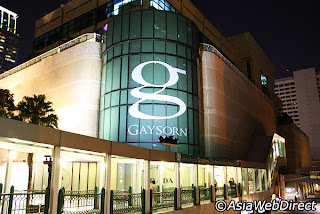 This service is part of the 'Purely Gaysorn' campaign showing a commitment to offer customers only the very best shopping experience and exclusive services.